A cheap rechargeable battery that harnesses energy by using the electrochemistry of organic molecules rather than metals is being touted by Harvard researchers as a breakthrough for renewable energy. The Harvard team reports that the battery, which they say can be applied on a power-grid scale, uses naturally abundant and small organic compounds called quinones rather than electrocatalysts from costly precious metals such as platinum. Quinones would be inexpensive to obtain and can be found in green plants or synthesized from crude oil. The battery designed by Harvard scientists and engineers used a quinone molecule that's almost identical to one that's found in rhubarb. The technology is outlined in the Jan. 9 edition of the journal Nature. Unlike solid-electrode batteries, flow batteries are recharged by two chemical components dissolved in fluids that are kept in separate tanks. The quinones in the Harvard team's battery are dissolved in water, which also prevents them from catching fire. These hydroquinones would perform a similar function to metal electrocatalysts such as platinum, because the molecules can store electrical energy efficiently. Flow batteries are well suited to storing large amounts of energy, but a major drawback to metal-based flow cells has been cost. According to MIT Technology review, a conventional metal-reliant flow battery costs an estimated $700 per kilowatt-hour of storage capacity, whereas the Harvard team's metal-free technology would bring those costs down to $27 per kilowatt-hour. Roy G. Gordon, one of the researchers who helped screen more than 10,000 quinone molecules to find the best candidate for the novel battery, said the introduction of the quinones to flow batteries could be a renewable-energy game-changer. "The whole world of electricity storage has been using metal ions in various charge states, but there is a limited number that you can put into solution and use to store energy, and none of them can economically store massive amounts of renewable energy," Gordon said. "With organic molecules, we introduce a vast new set of possibilities. Some of them will be terrible and some will be really good. With these quinones we have the first ones that look really good." The metal vanadium is used in most commercially advanced flow batteries. The Harvard battery performs just as well, the team said. 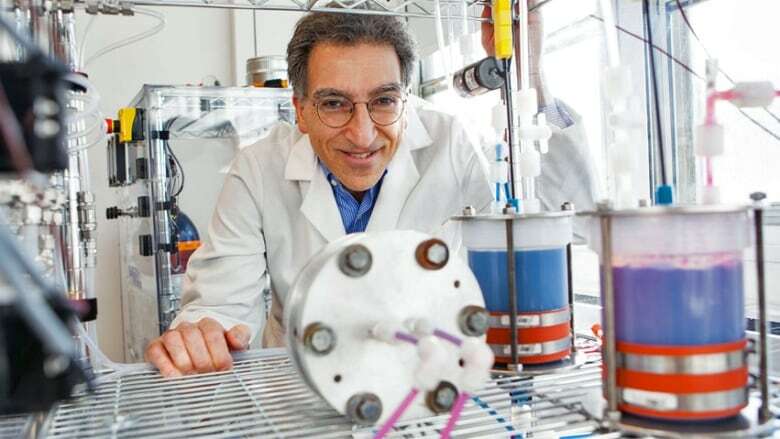 Lead researcher Michael J. Aziz said the storage of intermittent forms of renewable energy such as wind or solar power could be more economical if organic flow batteries were used to provide back-up power when the wind stops blowing and the sun isn't shining. "The intermittent renewables storage problem is the biggest barrier to getting most of our power from the sun and the wind," Aziz said. "A safe and economical flow battery could play a huge role in our transition off fossil fuels to renewable electricity. I'm excited that we have a good shot at it." A 2011 review from the American Chemical Society states that globally, the total electricity from wind power reached 74.3 gigawatts in 2006 and 94 gigawatts in 2007. By 2020, the World Energy Council predicts worldwide wind capacity could reach 474 gigawatts. The U.S. target is to generate 100 gigawatts of solar power by 2020. The researchers are working with a Connecticut-based company called Sustainable Innovations to create a portable, organic flow battery inside a unit about the size of a horse trailer. The flow battery would be hooked to solar panels on the roof of a commercial building. The energy stored in the battery could power the building or be used whenever there's a need for it.